0kinawa's cherry blossom season officially started last weekend, on January 18, with the Yaedake Cherry Blossom Festival taking place along the road leading up to Mt. Yaedake in Motobu town. From the middle of January until the middle of February, thousands of sakura-or cherry blossom--trees will all be blooming with radiant pink blossoms. However, the cherry blossoms will only be in bloom for a few days, so if you'd like to catch a glimpse of Japan's most popular flower, this is your chance. Last weekend, I decided to take advantage of a beautiful sunny afternoon and try to beat the crowd to the newly blooming cherry blossoms. I'd heard that the Nago Cherry Blossom Festival was one of the best occasions for viewing sakura, but I'd also heard that the festival attracts close to 200,000 visitors each year and I felt like getting a glimpse without the festivities or the crowd! Our first detour was the Nago Chuo Park and Nago Crossing Area near the Nago Castle Ruins. Though most of the buds were only beginning to bloom, some of the flowers had come out to display their radiant pink beauty to the world! I was stunned! Though not particularly easily fascinated by flowers, I'm certain there is something truly comforting about the sakura--Japan's most beloved plant and most celebrated flower! The pink hue in itself is comforting in that it is such a contrast from the dull gray sky we grow accustomed to during Okinawa's winter months. The origin of cherry blossom viewing goes back to the Heian period (794-1192) when aristocrats of the Japanese imperial court held parties to enjoy the beauty of sakura. Ladies of the imperial court would dress in their finest multi-layered kimono, and everyone would bring a box lunch and plenty of sake. They would all sit under the budding cherry trees drinking, composing poetry and song, and enjoying each other's company. The first formal cherry blossom viewing took place in 812 AD., but it wasn't until the Edo period that hanami (cherry blossom viewing parties) became popular among the common people. During this period, cherry trees were extensively cultivated throughout the country, and nobility began holding annual festivals for enjoying the scenic beauty of the sakura. The modern version of hanami is only a little different from the ancient days in that people don't compose much poetry under the trees and usually wear clothing more suitable for sitting on a blanket, but the food, sake, and community all remain as they were in the beginning. In mainland Japan, where the cherry blossoms bloom in April instead of January, the sakura mark a time of new beginnings. April is the month when the new school year starts for Japanese students, and it's also the time when companies start their new year and many college graduates begin working at their first job. So, more so in the mainland than on Okinawa, cherry blossoms have become synonymous with new beginnings and hanami parties provide a break from the stress of change. 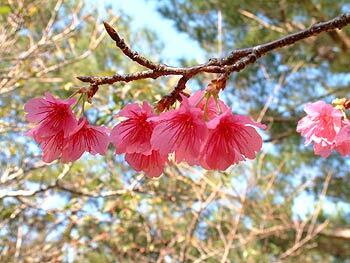 However, in Okinawa, our sakura bloom months before they do in the mainland. 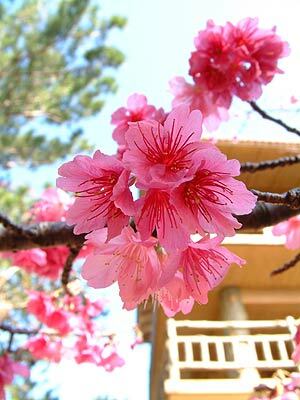 The cherry blossoms begin blooming in January in Okinawa, and they are at their peak in late March to April in Honshu region. In Hokkaido, sakura become in their peak in late May. While the rest of Japan has to suffer through a few more months of winter, Okinawa's climate is adequate to bring about an earlier bloom of beautiful sakura, leaving mainlanders jealously watching their televisions in anticipation of their turn to sit under a blooming cherry blossom tree. The Nago Cherry Blossom Festival is by far the most popular celebration of the sakura, attracting around 200,000 visitors each year to participate in its exciting events, parades, street dances, stage entertainment, and other festivities. This year's festival will take place from Jan. 31 to Feb. 2. To get to the festival, drive north on highway 58 until you reach Nago. Near the last expressway exit, you'll surely see signs announcing the 41st Annual Nago Cherry Blossom Festival, but if you don't, look for signs to the Nago Castle Ruins. If you're heading north, it'll be on your right. The 25th Annual Motobu Yaedake Cherry Blossom Festival is currently taking place and will last until Sunday, February 2 at Mt. Yaedake in Motobu. 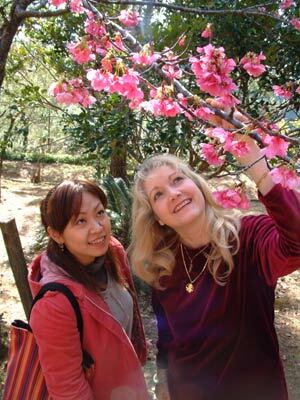 On the opposite side of Okinawa, the Naha Cherry Blossom Festival 2003 will go from Wednesday, February 12, to Sunday, February 16, at Yogi Park in Naha City. The Nakijin Castle is another great spot for viewing sakura. Whether you're looking forward to attending a huge cherry blossom festival or wander through sakura trees in isolation, you're sure to find what you're looking for in the next few weeks. I hope you'll take the chance to check out Japan's most beloved flower! Good luck on your search!